Happy New Year! I wish everyone will have a sweet year in 2015. 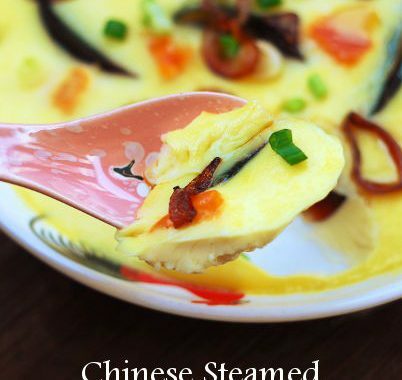 🙂 I’ll start my first recipe of 2015 with a dessert (sweet ma). 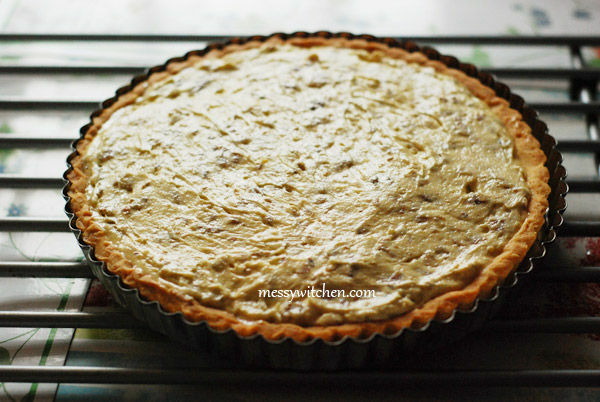 The recipe I choose is walnut tart or tarte aux noix in French. 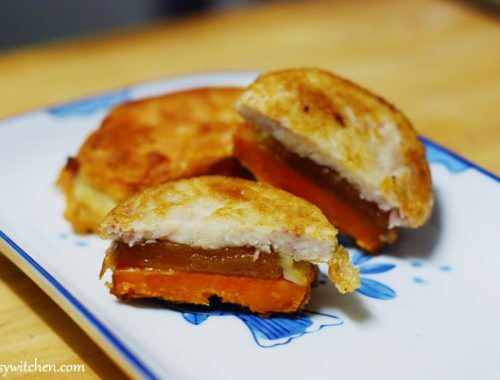 This recipe was adapted from Pâtisserie by Murielle Valette, a French pastry chef. I couldn’t fathom how this walnut tart would taste like or the texture of it hence it got me interested. I’m very satisfied with this walnut tart. It’ll be my go-to walnut tart recipe. 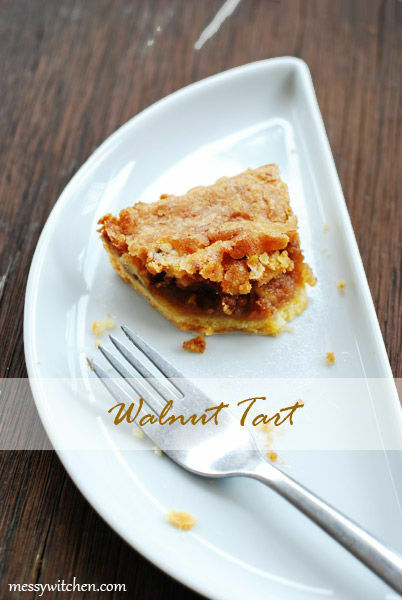 Walnut tart – so good! On a work surface, place flour, salt and diced butter. Coat each piece of butter with flour and then work the mixture until it becomes sandy. 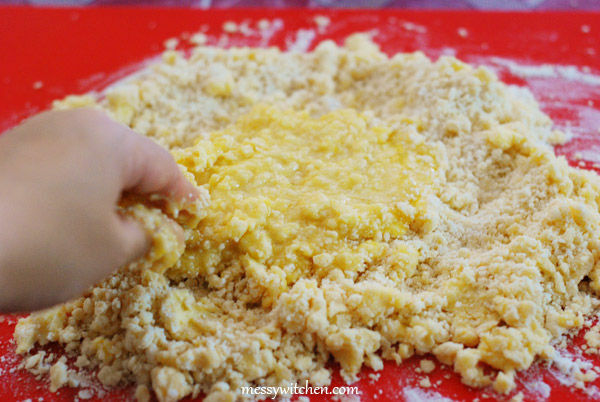 Make a well in the centre and add egg and sugar. 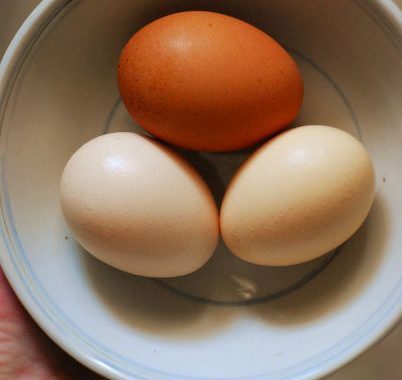 Mix the egg with sugar. Then slowly incorporate the flour starting at the inside of the well until is has an even consistency. Do not overwork! 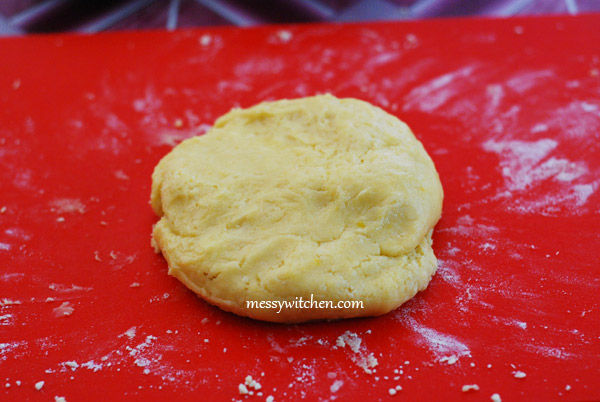 Make the pastry into a ball and press it flat. Wrap with cling wrap and let it rest in the fridge for a minimum of 1 hour. Sprinkle some flour on the work surface and pastry. Roll out the sweet pastry to 3mm thickness with a sheet of cling film underneath. 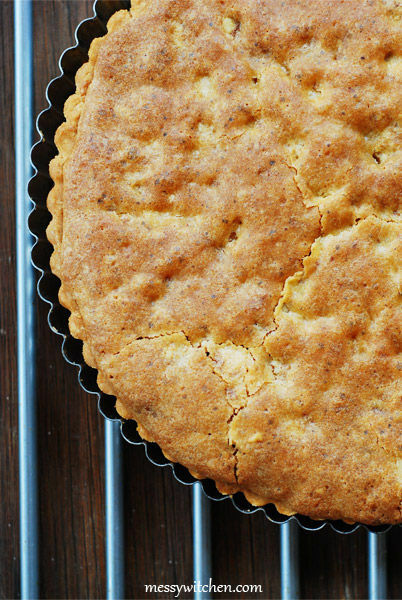 This is for easy transfer to the tart pan. 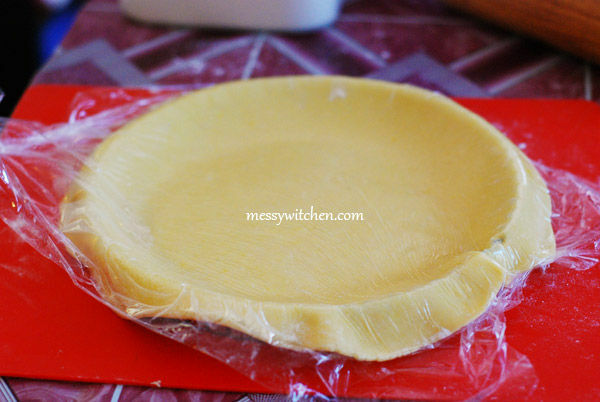 Carefully place the rolled pastry on the 24cm tart pan. 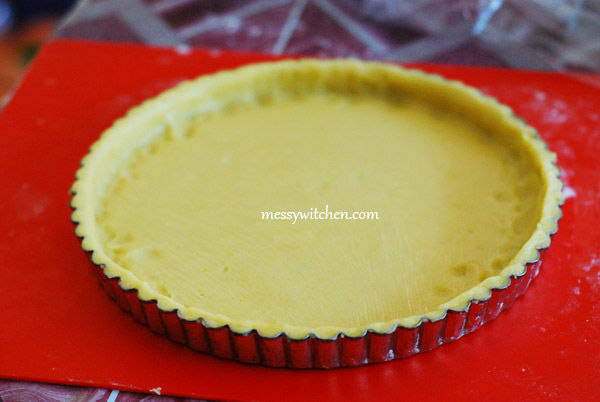 Press the pastry into the edges to line the base and sides. Remove the excess party with a knife / rolling pin / with your hand by cutting the pastry at the pan’s sharp edges. Chill in the fridge for 30 minutes. Then cool for 10 minutes and remove the baking paper without spilling the rice. Put the tart case back into the oven and bake for an extra 10 minutes without the rice. It’s done once the center of pastry is light golden brown. Now to make walnut cream. Cream the butter and sugar. Then alternately add batches of broken walnuts and eggs. Once the pastry base has cooled, spread the walnut cream evenly. 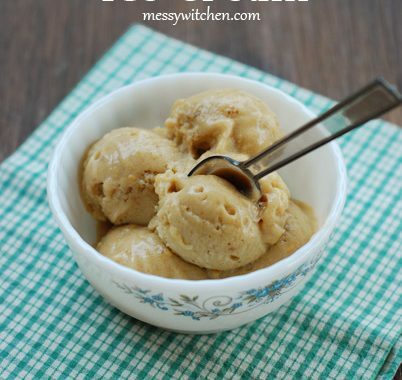 I fill my walnut cream to this level and then it overflows during baking. Luckily I noticed it and place a baking tray underneath the tart pan. Bake at 160oC for 30 – 40 minutes until the cream is set and golden brown. Cool the walnut tart in the tin at room temperature. I have remaining walnut cream and extra sweet pastry from earlier and I use it to make walnut tartlets. I made about 5 walnut tartlets. 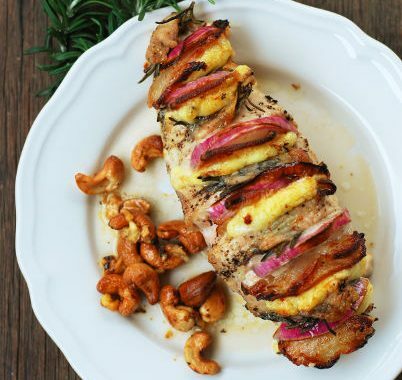 Wholesome wrap in your mouth heavenly feeling… I love this walnut tart. It’s not too sweet since I’ve reduced the sugar. 1. Place flour, salt and diced butter on the work surface. 2. Use your fingertips to coat each piece of butter with flour, then with both hands, work the mixture until it has a sandy texture. 3. 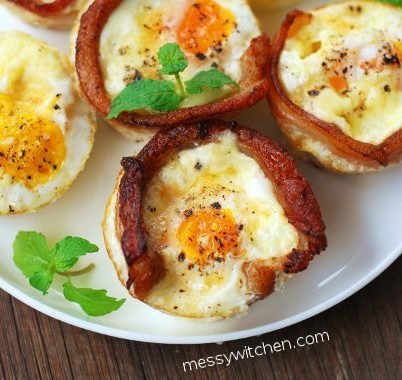 Make a well and add egg and sugar in the centre. 4. 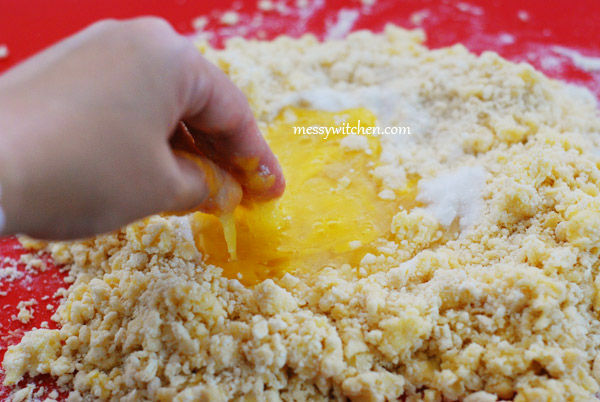 Use your fingertips to mix the egg with sugar, then incorporate the flour mix, starting at the inside of the well until it has an even consistency. Note: Do not overwork – when all the ingredients are combined, it is ready. 5. 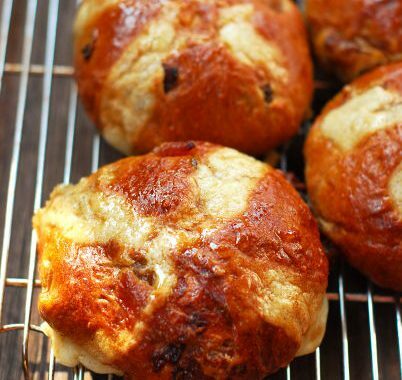 Shape the pastry into a ball and press it flat. Wrap in cling film and rest in the fridge for a minimum of 1 hour. 6. Sprinkle some flour on the work surface and pastry. 7. Roll out the sweet pastry with a sheet of cling film underneath to 3mm thickness. Note: Reason for the cling film is for easy transfer to the tart pan since it’s difficult to work the pastry in my country’s warm weather. Besides that this sweet pastry is a little sticky. 8. 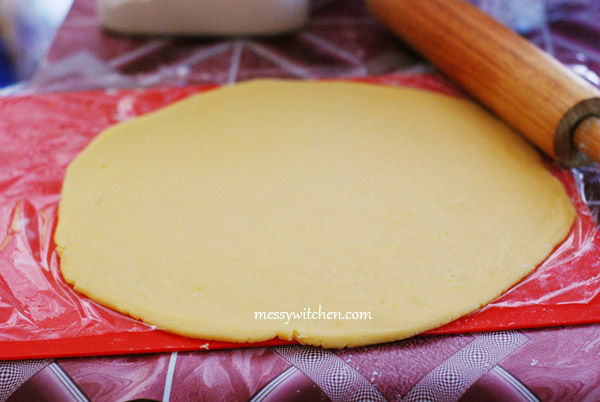 Line the 24cm tart pan with the rolled pastry. 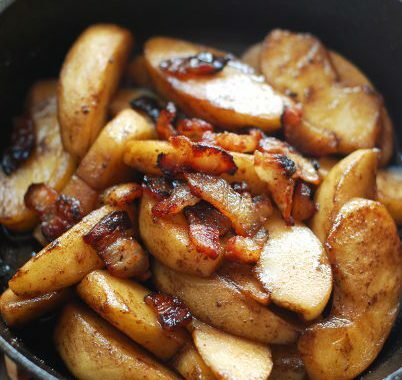 Gently press it into the edges with your fingertips to line the base and sides. Remove the excess pastry either with a knife, rolling pin or with your hand by cutting the pastry at the pan’s sharp edges. Chill in the fridge for 30 minutes. 9. 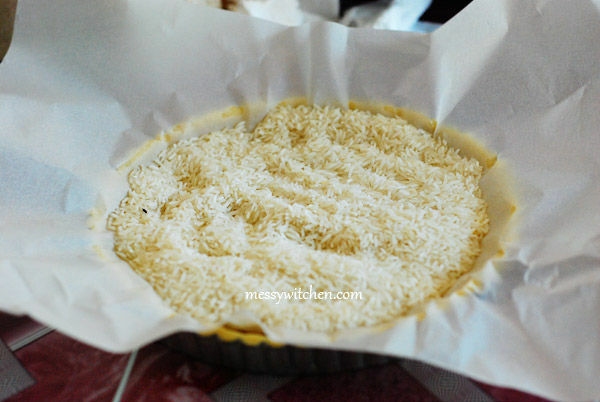 Line the pastry base with baking paper and fill the tart case with baking beans/rice/ming beans. Blind bake for 35 minutes at 160oC. 10. Allow to cool for 10 minutes. Then remove the baking paper with the baking beans in it carefully. 11. Return the tart case back in the oven for an extra 10 minutes – minus baking beans to even up the color. 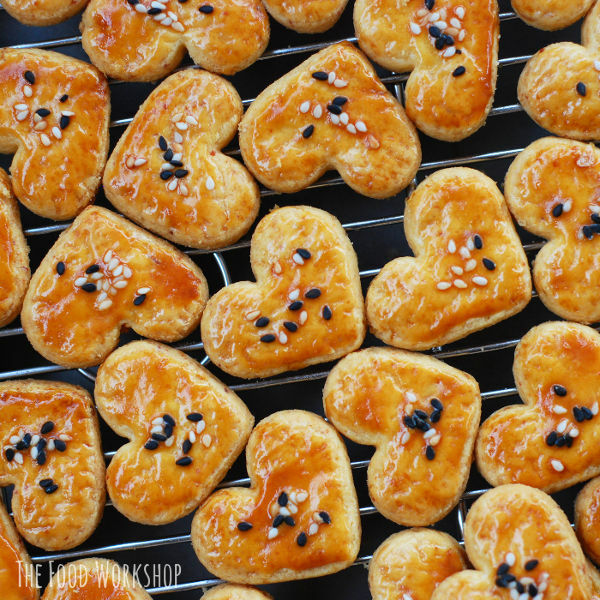 The center of the pastry must be light golden brown. 1. With a hand mixer or electric mixer fitted with a paddle, cream the butter and sugar. 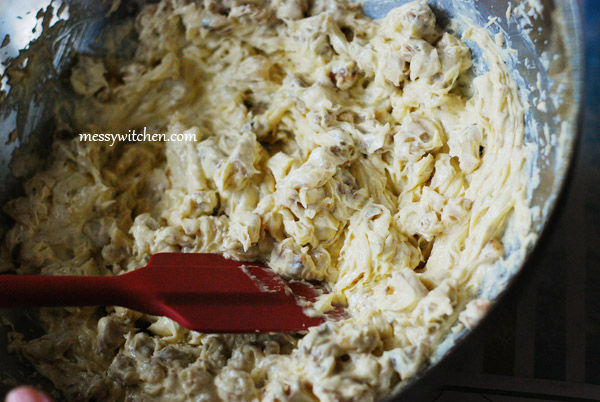 Then alternately add batches of broken walnuts and eggs. 2. Once the pastry base has cooled, spread the walnut cream evenly. 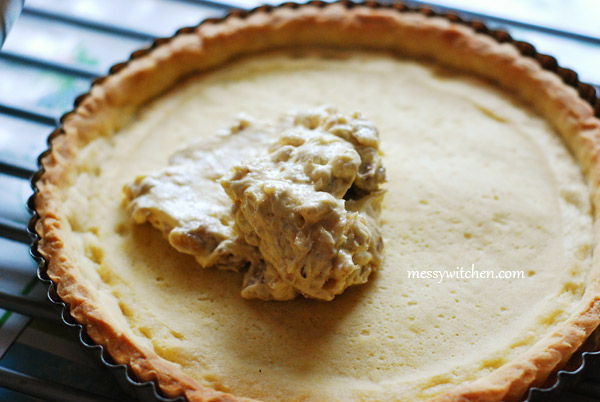 Note: Don’t fill the tart too full with walnut cream or it will overflow during baking. 3. 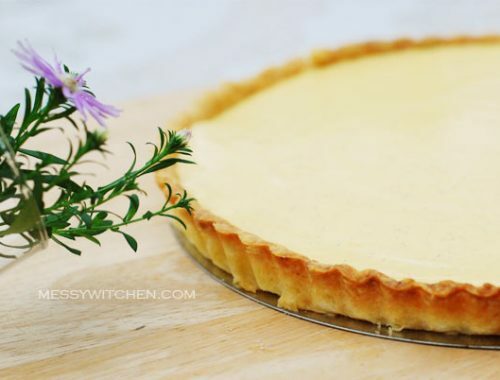 Bake the tart at 160oC for 30 – 40 minutes (mine baked at 38 mins) until the cream is set and golden brown. Cool at room temperature in the tin. Note: You will have remaining walnut cream and extra sweet pastry from earlier. Use it to make walnut tartlets. I made about 5 walnut tartlets.